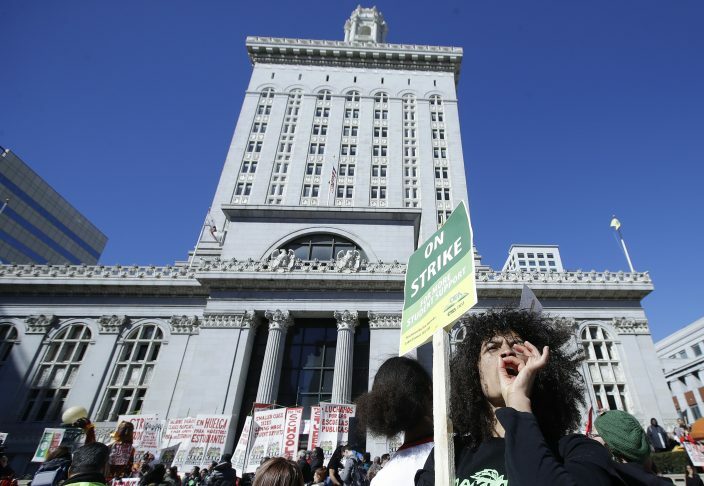 Teachers in Oakland, California, headed into another day of strikes Friday after parents and students applauded their demands by keeping city classrooms empty. 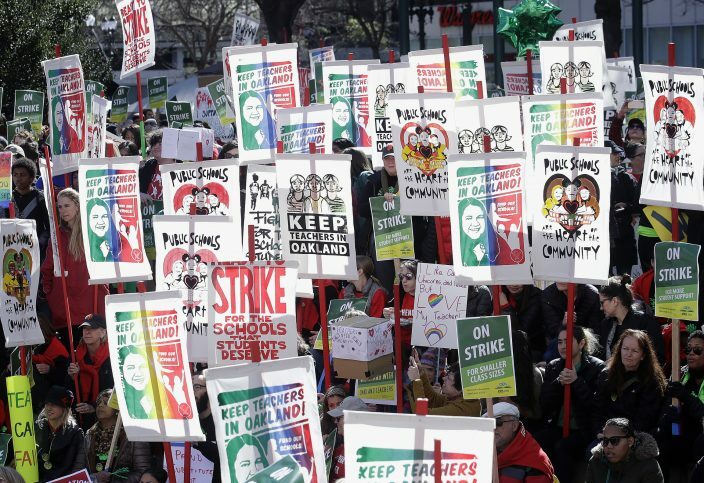 Oakland's 3,000 teachers went on strike Thursday over pay, class sizes and other issues, holding a boisterous rally at City Hall, marching through downtown streets and picketing outside the city's 86 schools. Union officials from the Oakland Education Association were returning Friday morning to the negotiating table with district officials. "Parents, teachers and students spoke with their feet today," union president Keith Brown said Thursday evening, calling for a strong turnout on Day Two. "Strikes are won on the streets, not at the bargaining table." The teachers are asking for a 12 percent retroactive raise covering 2017 to 2020 to compensate for what they say are among the lowest salaries for public school teachers in the expensive San Francisco Bay Area. "I'm bleeding out every month, falling further into debt," said Sarah Trauben, 30, who teaches english and government at Oakland Technical High School. She's taken on a second job as an SAT tutor to make ends meet. Teachers also want smaller class sizes and say the district needs to hire more full-time nurses and school counselors. In Sierra Donaldson's 9th grade biology class at Oakland Tech, she worries about safety in lab classes. "Class size is huge. I need to keep an eye on 32 14-year-olds, and I feel like it's just not safe if we're working with bacteria or other materials," said Donaldson. A starting salary in the district is $46,500 a year and the average salary is $63,000, according to the union. In neighboring Berkeley, a starting teacher makes $51,000 a year and the average salary is $75,000, the union said. "We cannot afford to live here," said kindergarten teacher Elena Njemanze, who has been teaching in Oakland for eight years and has a master's degree from Mills College. "I can only afford to pay rent because I have my parents helping me." The district initially offered a 5 percent raise covering 2017 to 2020, saying it is squeezed by rising costs and a budget crisis. In negotiations Wednesday aimed at averting a strike, the district increased its proposal to a 7 percent raise over four years and a one-time 1.5 percent bonus. But union officials rejected the offer. 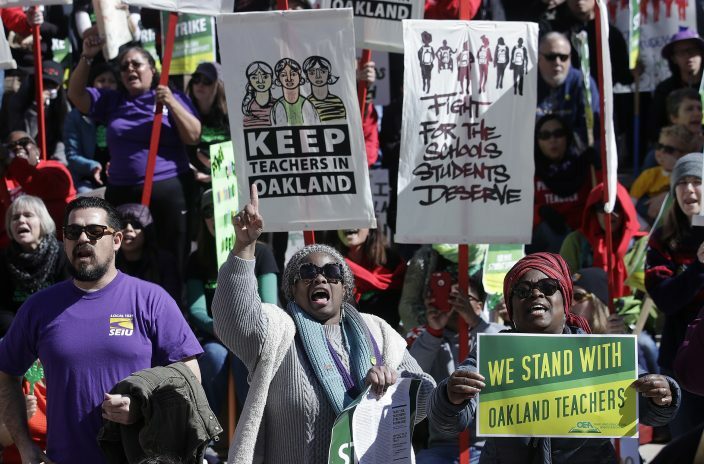 Oakland Unified School District spokesman John Sasaki said school administrators hope to get a counter proposal from the union when negotiations resume Friday. "We haven't heard any proposal since last May so we're hoping they have something for us when we meet tomorrow," Sasaki said. Local radio host Sana G. posted on Instagram a short video with a dozen Bay Area celebrities, including comedians, musicians, sports stars and others each saying, "I stand with Oakland teachers." Local celebrities like MC Hammer, Stephen Curry and Oscar winner Mahershala Ali showed support in a video to say they "stand with Oakland teachers." Parents showed their support by honoring the picket line, said Will Lynch, a father with a second-grader at Glenview Elementary School, where 9 children out of 460 turned up for school. "What are we doing not paying teachers enough money? It reflects our society's values in a very negative way," he said. "We did not have a single student come to school today," said Katherine Carter, principal at Oakland SOL middle school. "A couple kids were on the picket lines, but aside from that no kids." No students turned up at West Oakland Middle School either, said Brown, the union president. "It's unfortunate that it's come to this, but it shines a spotlight on larger issues," she said. "Public education is a crisis in our country. The teachers are now lifting that up across different states." The union has also called for the district to scrap plans to close as many as 24 schools that serve primarily African-American and Latino students. The union fears further students will be lost to charter schools that drain more than $57 million a year from the district. 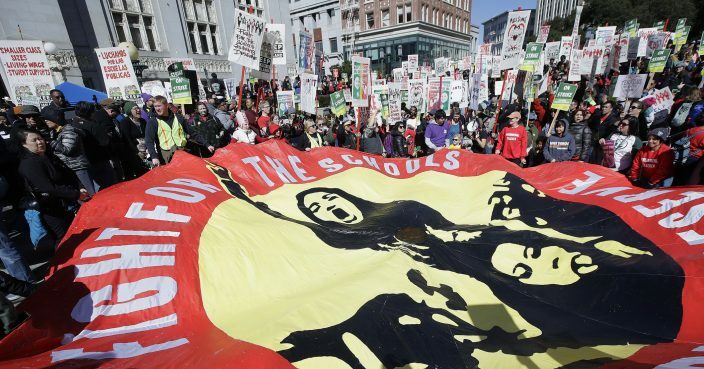 Recent strikes across the nation have built on a wave of teacher activism that began last spring. Unions for West Virginia teachers, who staged a nine-day walkout last year, ended another two-day strike Wednesday. Last week, teachers in Denver ended a three-day walkout after reaching a tentative deal raising their wages. 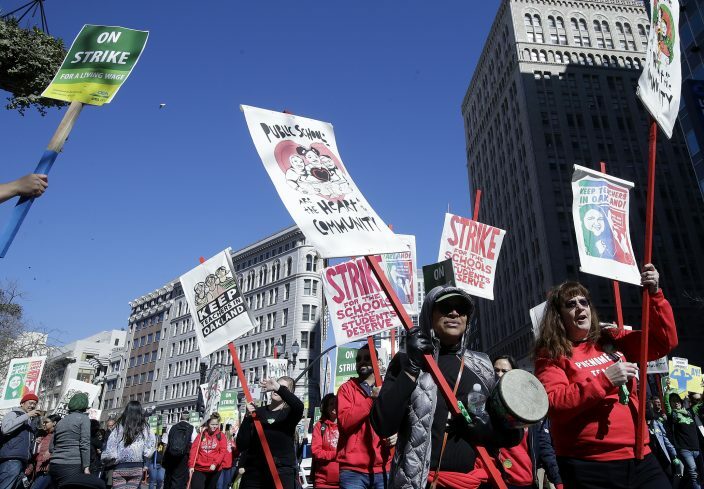 Teachers in Los Angeles, the nation's second-largest school district, staged a six-day strike last month that ended when they settled on a 6-percent raise with promises of smaller class sizes and the addition of nurses and counselors. Associated Press writers Janie Har and Olga R. Rodriguez in San Francisco contributed to this report.